Disclaimer: I was provided complimentary spa services in exchange for an honest review. All thoughts and opinions expressed are my own. 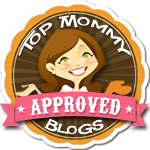 A few times a year I take my kids out individually for a special mommy and me day. I give them choices throughout the day about the different activities and places they like to visit. It’s become a favorite event for all of us. 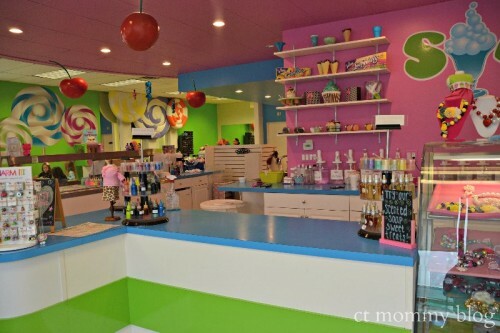 This past weekend my twins and I had a special girls day at Sundae Spa in Waterbury, CT. The girls started kindergarten this year so I wanted to reward all of their hard work with a special mommy and me day. 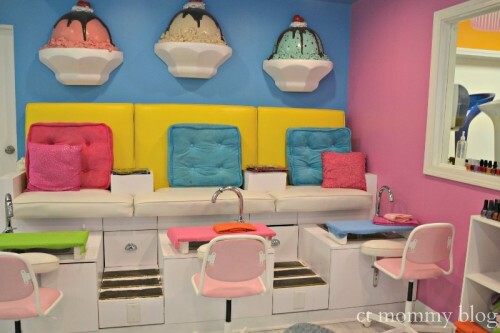 This fabulous ice cream sundae themed kid’s salon and spa is changing its name from Sundae Spa to Sundae Spatacular. This spa has recently undergone a total revamp with renovated interiors, a new menu of services, expanded party room and off-site party packages. When we first walked up to the spa, my girls immediately noticed the giant cherries suspended from the ceiling. 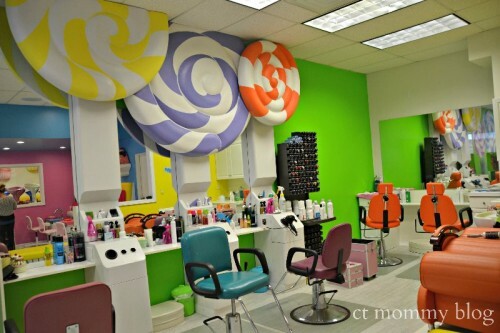 The interior is a combination of a scene out of Willa Wonka’s Chocolate Factory and Candy Land coming to life. There are giant 3D candies and ice cream sundaes everywhere. 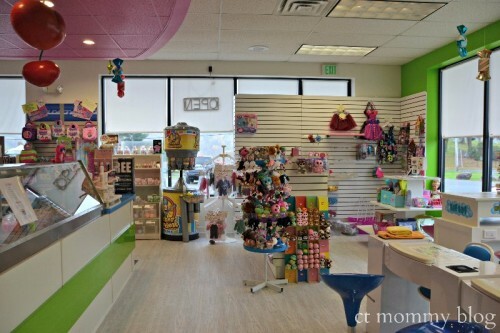 It’s a kid’s dream space. I’m only sad that this didn’t exist when I was a little girl. Walk-ins are welcome but the spa suggests making appointments for the best experience, especially on weekends. This was my girls’ first time visiting a spa and I must tell you they LOVED it. They were a little shy at first, but it’s been almost a week and they’re still talking about all the fun they had. 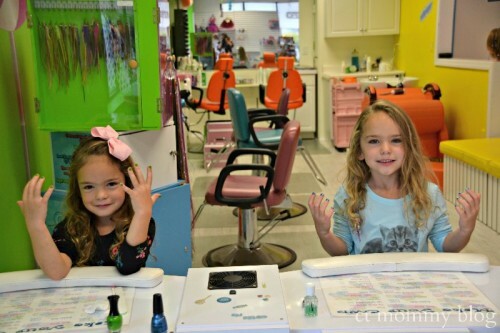 My girls are 5-years-old and it seems like the perfect age to introduce them to a little girly pampering. The spa has an a la carte menu of services for skin, hair and nails. 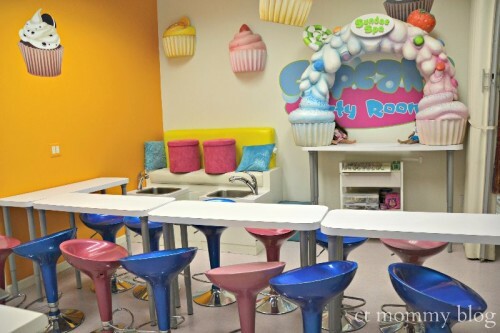 They also offer “Sundae Dessert Packages” where kids choose combinations of different services. Best of all, all services include an ice cream sundae. During our trip, my girls got a chance to make slime using custom colors, glitter and scents. 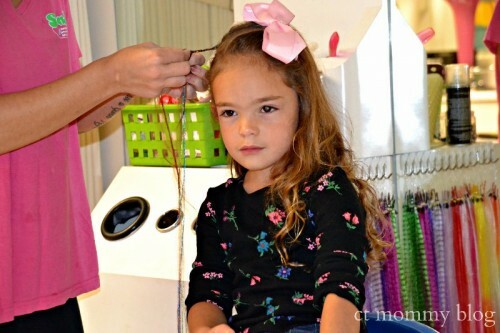 They got their hair wrapped with special beads, their very first manicure, and a glitter tattoo! 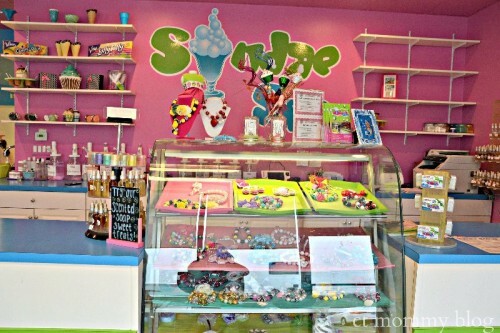 Turn any of the Sundae Dessert Packages into a private party for 8 kids or more. The parties include the spa services plus use of a private party room, party staff, invitations, favors, a voucher for future visits, and entertainment. You can even choose a party theme or have character rentals. New to the spa are off-site sleepover parties with eleven different themes. Sleepovers include themed lighted tents, mattress/pillows, tables, lanterns, and decorations. It’s kids glamping in your living room! My girls had so much fun being pampered for the day. It was a great way to share a mommy and me day. 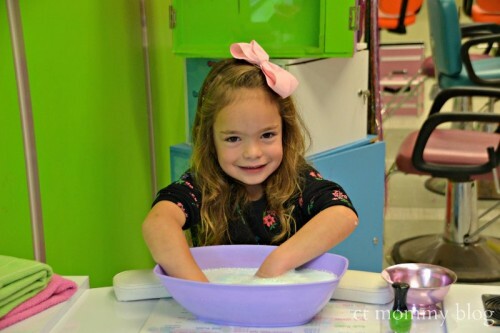 I’d highly suggest a visit whether you’re planning your daughter’s next birthday party or just want a day of girly pampering, Sundae Spatacular is the sweetest destination.